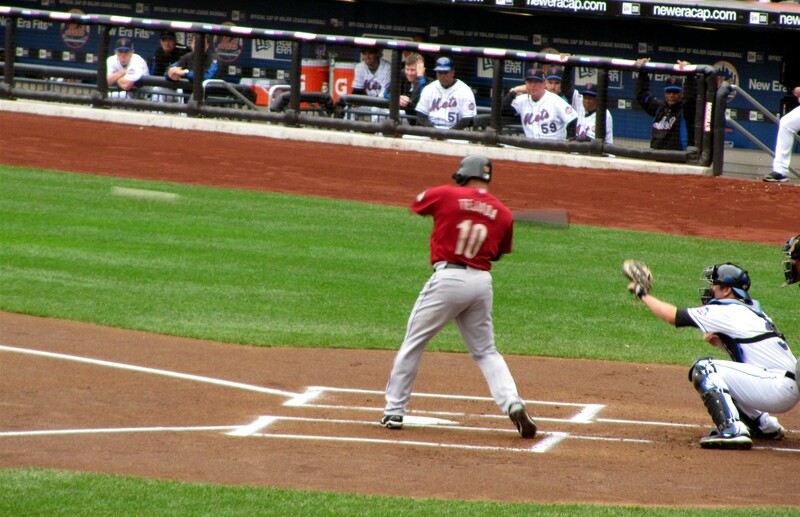 For a while, I’d been wanting to go back to Citi Field for a second game. We’d gone in April when the Stadium was just two weeks old. I wasn’t a huge fan of it then. It was too crowded and I felt like we couldn’t get anywhere near the field. Well, a few weeks ago, I found a pair of $25/ticket upper deck tickets on Stub Hub for $3 each. We couldn’t pass it up. 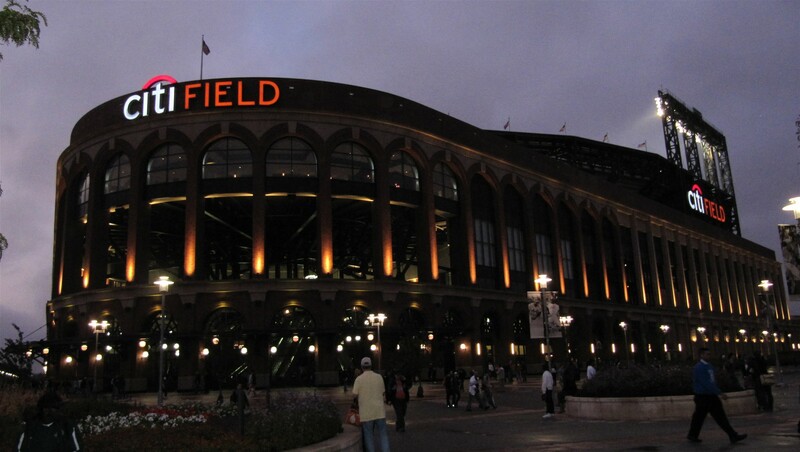 I was excited to see Citi Field again, not only because I knew it would be far less crowded due to the Mets poor performance but, because it would be our first game ever in the month of October. 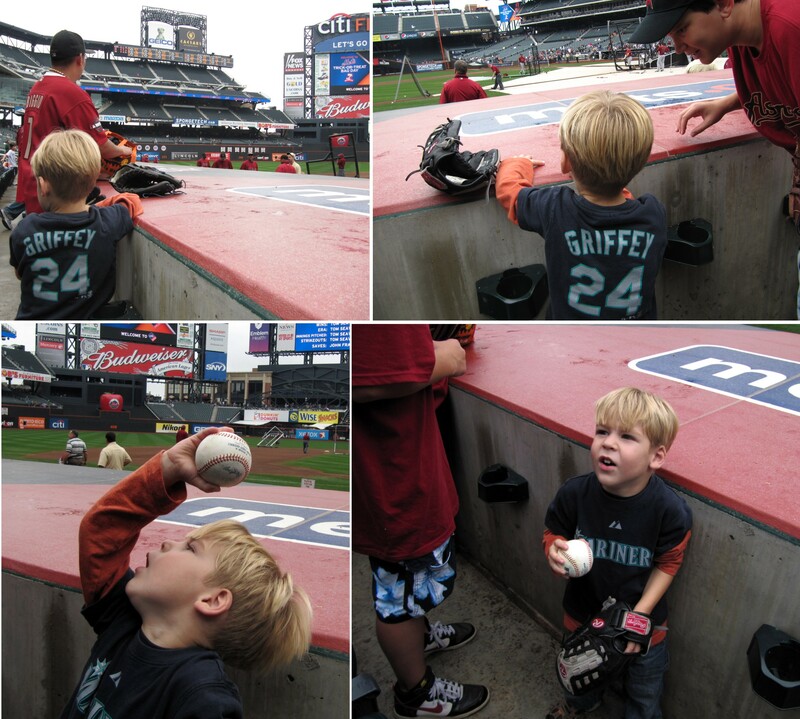 Plus, I was hoping we’d get a ball — our first ever in Queens. 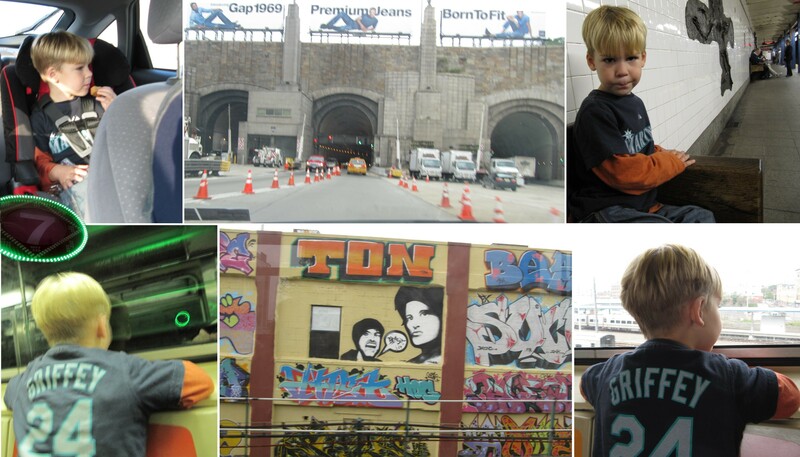 …we headed through the Lincoln Tunnel, parked in the Upper West side, hopped on the C-Train at 81st Street, transferred to the 7-Train at 42nd, watched all of the graffiti go by in the rooftops of Queens, and arrived at Citi Field at about 11:40 a.m. In the picture above to the left, the middle guy is Samuel Gervacio and the guy on the right is Wilton Lopez. Lopez was having a grand old time toying with the crowd. 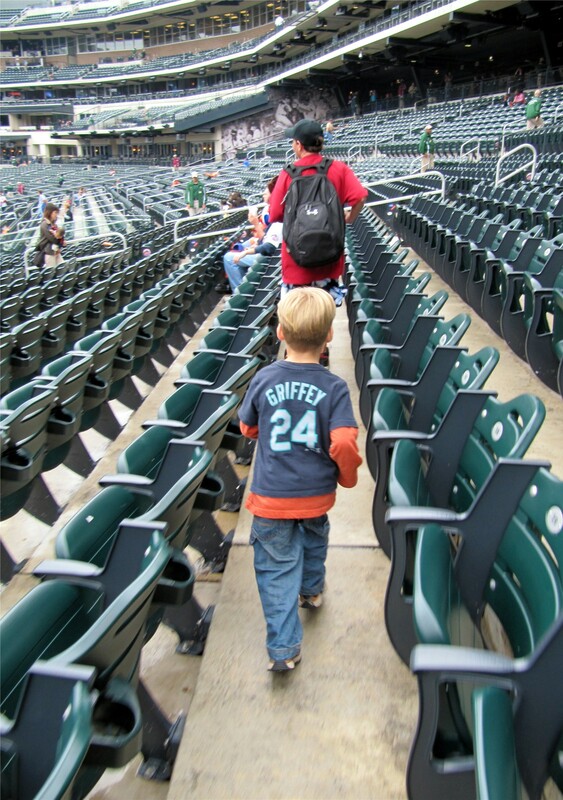 On every ball he caught, he faked like he was going to toss into the stands and then he’d turn around with an ear-to-ear smile and throw it in toward the bucket. Eventually, former Astro and current Astros coach Jose Cruz (above to the far left) walked out to LF with his fungo bat. Meanwhile, Lopez was taunting the crowd with yet another ball. Quitely but very authoritatively, Cruz called out to Lopez and motioned for the ball. Lopez’s face instantly turned from playful-kid to serious-and-respectful. He toss the ball to Cruz without hesitation. Cook & Son’s first ball ever in Queens! 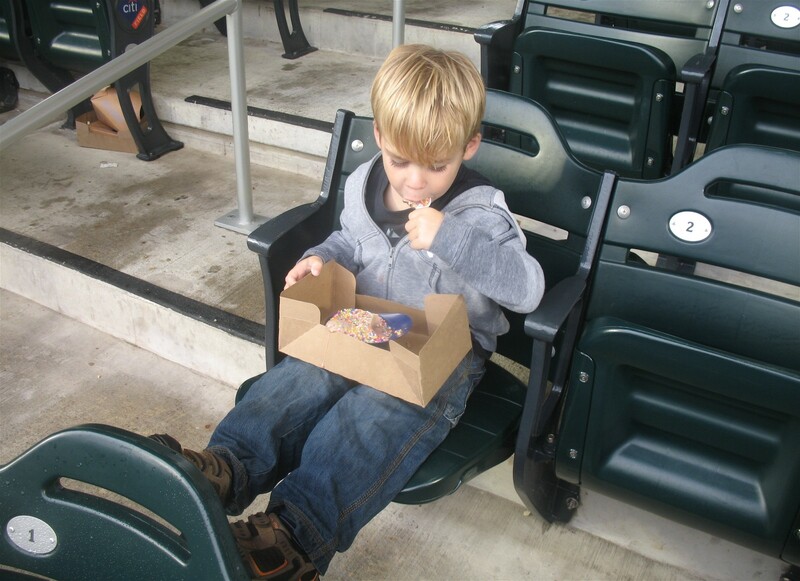 And our first ball with the patented Houston Astros “H” magic markered onto the sweet spot. Tim was a little upset that he did’t catch it himself. He got bit by the catching bug, I guess, after meeting up with Ryan Rowland-Smith in Toronto the previous weekend. At this point, Tim was just wearing his socks and his shoes were in my backpack. I told him to put on his shoes so we could head out to the OF and poke around. He wasn’t too interested in his shoes. So, I popped him up on my shoulders and we walked to the LF seats. On our way, I heard, “Hey, Todd!” I looked up and it was Alex K. from “Riveravenue.” We’d met Alex in Chicago at Tim’s 30th MLB team milestone game. We’d exchanged some emails and knew we might run into each other at this game. 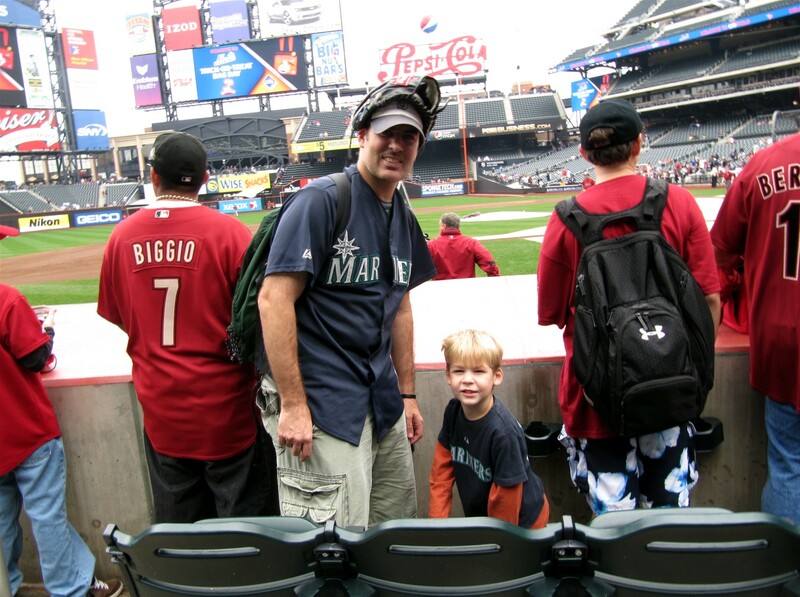 As we went over and started chatting with Alex, I heard another voice call out, “Hi Todd and Tim.” It was Joe from “Baseballexperiences.” I’d never met Joe before, but I’d read about him on Zack Hample’s Blog and, through Zack, on his own blog. Joe introduced himself and said he reads our blog. Its always cool to meet people from MLBlogs. And these guys would turn out to be extremely cool and fun to roam around the stadium with at several points during the day. They were absolutely great with Tim and he couldn’t get enough of them. 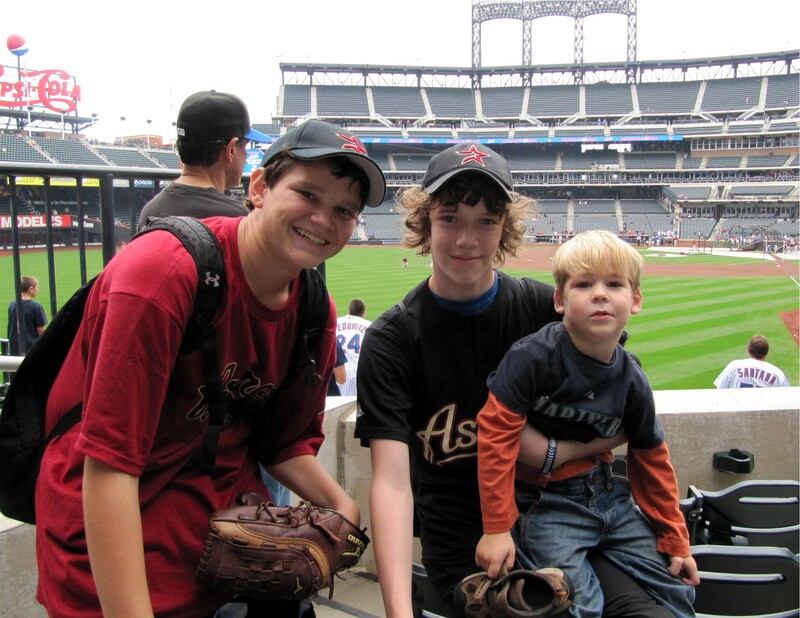 Joe is on the left and Alex is holding Tim on his lap as he reclines on the back of a seat in LF. Note that Tim is holding his shoe. We pulled the old Billy Madison “everyone my age __________, its the coolest!” trick on Tim (we filled in the blank with “wears shoes”), and it worked like a charm. Tim was happy to wear his shoes after seeing that Joe and Alex were also wearing shoes. The guy standing a couple sections in front of Joe in the green jacket asked “do you guys have tickets over here?” Joe flashed his ticket and the guy responded, “Yep, you do, head on in, guys.” I think he automatically assumed we all had the right tickets. He didn’t seem too concerned about checking the rest of our tickets, but I showed our loaner ticket anyway. …and it worked. Alex and Joe both called out, “Hey, Stech,” to Astros bullpen coach Strech Suba (I think he’s the bullpen coach, at least). I think Suba threw three balls over. Tim and I got one. Joe got one. And, I think (but am not positive) that Alex got one as well. A big time assist and thank you to Alex and Joe for that ball. Tim was looking the other way when Suba threw us the ball. As I caught it, he turned his head to look toward Suba. My glove was above his head and I instantly transferred the ball from my glove to my bare hand and from my bare hand to Tim’s glove. I then erupted with, “Tim, you just caught that ball!” Joe and Alex followed suit with a lot of enthusiasm. Tim was fooled, and was happy to have “caught” another ball himself. Joe and Alex, along with some other people, went over to see if he was autographing. But he announced to everyone in the section that he wasn’t signing. He was chatting with his friends who he doesn’t get to see much because (he said) he doesn’t get to NYC much. He stood there and chatted with some people for a long time. BP ended and Alex and Joe suggested we head out to the kids’ play area — they were always thinking about what would make the day more fun for Tim. …after a few minutes, the ice cream man came driving down the slummish auto-row. Not suprisingly, there were no little kids chasing him through the auto-slums. By the way, the auto-slums are just to the left of the 3B line of the whiffle ball field. 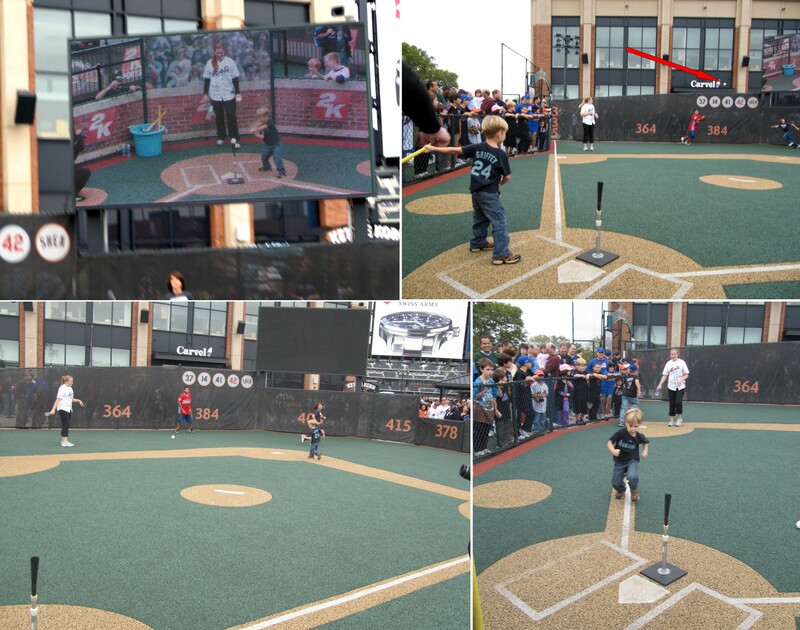 In the top left, we see Tim taking a hack on the whiffle ball field’s jumbo screen. Top right, two fielders make an effort for the ball but Tim shots it between them for a liner off of the LF wall. Then it was time to round the bases. Tim loved the whiffle ball field. The apple was in the “up” position during BP and Tim told me that is said “Mariners” on it. He also thought the little leaf at the top of the apple was great. To the left, you see our view of the plate. To the right, Alex took a shot of us as Tim scarfed down his chocolate ice cream with sprinkles. By the way, I just mentioned Alex again. 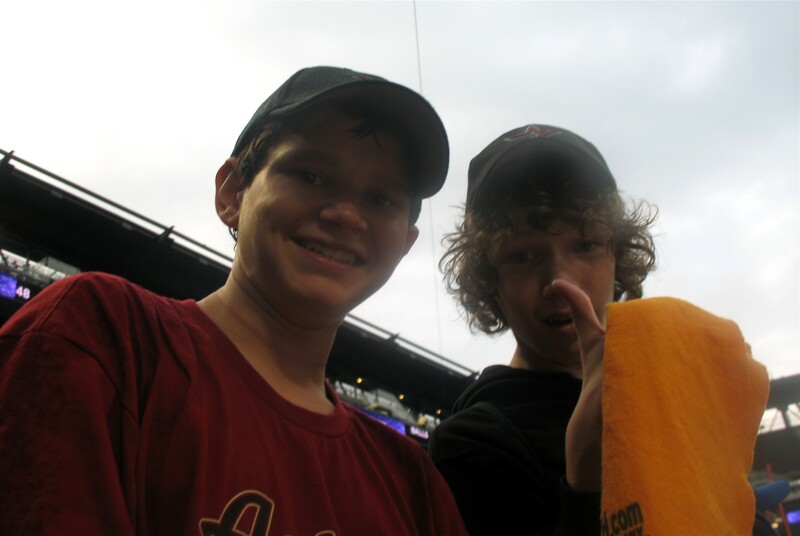 He and Joe saw us in our seats and came and sat by us in the first inning. There was no one in our row! 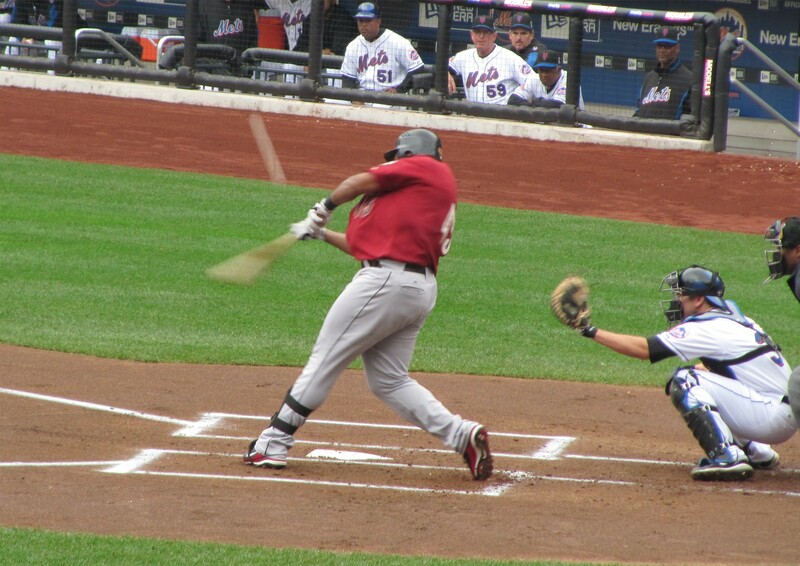 Carlos “El Caballo” Lee then popped up this pitch for an out. …it was pretty funny. He was gone from our row (literally) for about 7 seconds. After the second inning, Tim was getting restless. I asked him if he wanted to go see the Pepsi Porch in RF (second deck)…where I told him he could see the train passing back-and-forth. He did. …that’s very cool. Every stadium has a bunch of seats that can’t see the jumbo screen. 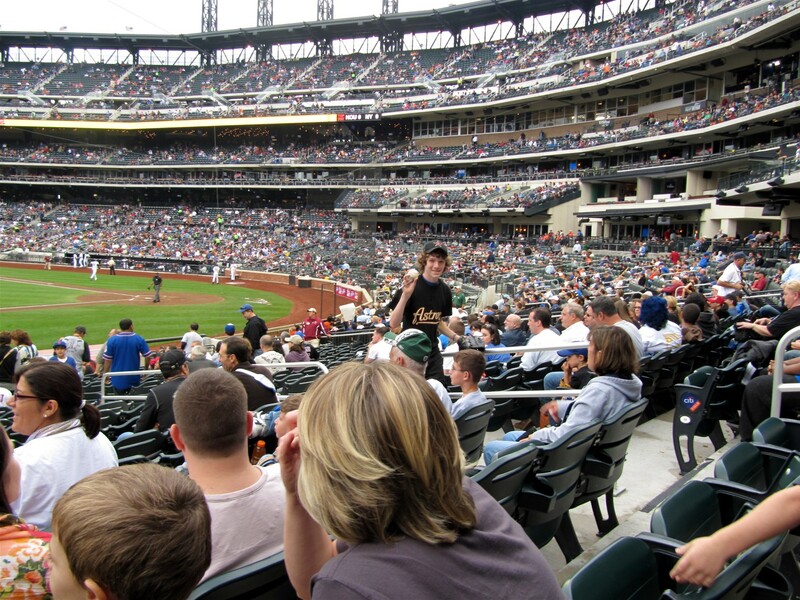 But with this second screen, maybe Citi Field does not have any seats in a jumbo screen blind spot. …a huge “weed bed.” Beautiful. From the spot of that last photo, we turned around and headed up the stairs to the top of the stadium in RF foul territory — another area we’d never visited before at Citi Field. See all of the glass on the second deck across the stadium — behind the LF foul pole? That’s a restaurant. I asked Alex and Joe if they’d ever gone there. One of their dad’s had been and wasn’t impressed. There is a deck at the bottom of the restaurant (outside the glass), but apparently they won’t let people out on the deck because they made the railing too short and fear that people will fall into the field level. 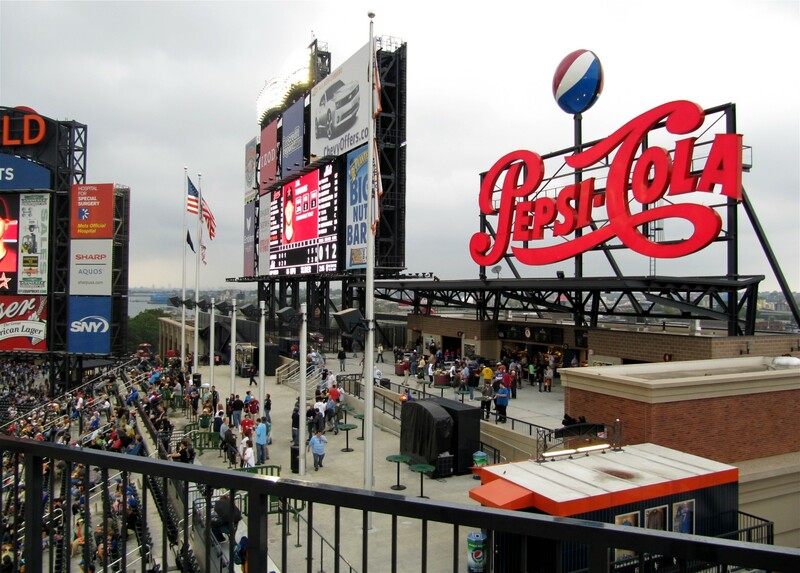 Due to the Sterling Club and suites that close-off the main concourse from the field behind home plate, and the railings and ushers that keep the commoners from getting into the seats behind home plate, this is the best view most people will ever get from behing home plate at Citi Field. I gotta admit, that’s pretty cool. They have a similar picnic area behind home plate and above the main enterance at Safeco Field, but people up there have no clue what is going on with the game. Nice touch, Mets. They have another one of these jumbo screens on the back of the CF scoreboard for the parents standing in the play area with their kids. The lightest bat was really still too heavy for him. But he had some decent hits. Right after Tim hit in the cage, the rain started to pour down. 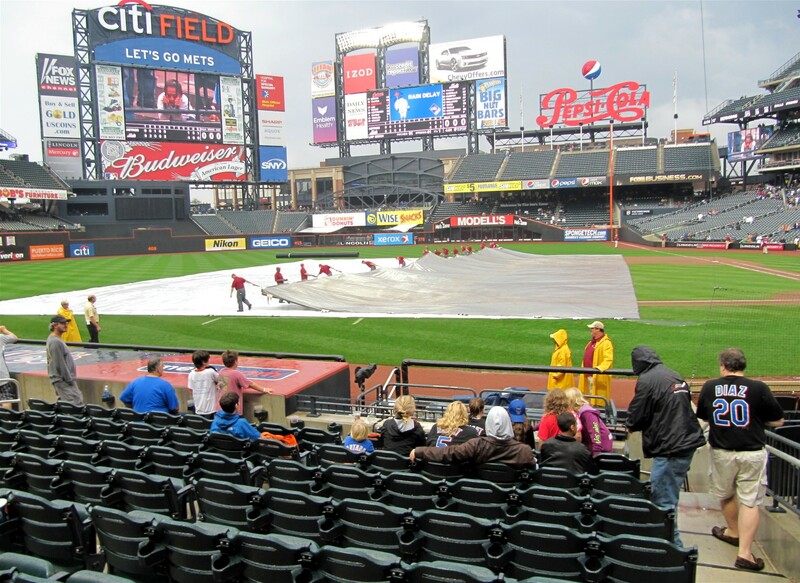 It was the end of the fifth inning (an official game), and the umps called for a rain delay. Tim and I trudged around in our rain gear until we eventually found ourselves back in the Rotunda. Tim saw some teenagers climb half-way up the “2” in Jackie Robinson’s big blue “42.” Tim wanted to do it too, but (a) it was too high and (b) dad was having none of it. By this time, it was about 2:30 or 3:00 pm, and Tim was ridiculously tired (no nap) and he lost it when he wasn’t allowed the scale the wet, slippery and tall 42. As I tried to calm him down a bit, Alex and Joe found us. They tried their best to cheer him up but he was whiney and crying up a storm. Then, Alex asked him, “Tim do you want to go upstairs and play catch?” Instantly, Tim’s crying stopped on a dime. “Yes!! !,” he responded. “Ahh, HA!,” I said to Alex and Joe, “you’ve witnessed some of Tim’s classic fake crying!” One of them asked, “You were faking it, Tim? !” Tim responded, “well, I was a little sad.” Classic Tim, the actor! We had time to kill. 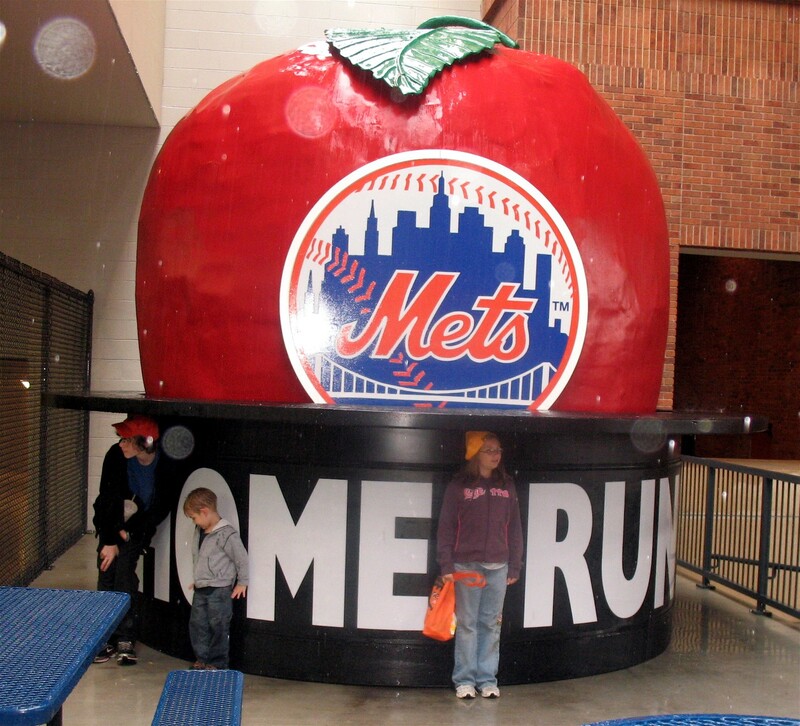 So next, we went and looked at all of the “game used” stuff the Mets had for sale in the field level concourse. After looking at that stuff for a bit, Alex and Joe asked if we want to go into the Sterling Club. Now, the Sterling Club is the ultra-exclusive and pricey luxury club level area for all of the people with the big railed-off cushy seats behind home plate. Alex’s dad had got tickets somehow. After paying $3 per ticket, how could I pass up an opportunity for Tim and I to see the Sterling Club. Joe and Alex entered the club. Safely inside, Alex passed off his ticket to Joe and came and passed it off to me. Joe then re-entered on his own. Tim and I strolled around a minute in the Rotunda and then headed up the Sterling Club escalator and into the club. In the top left, there is a ridiculously fancy looking restaurant, which looked out of place (and was totally empty) at a ballpark. 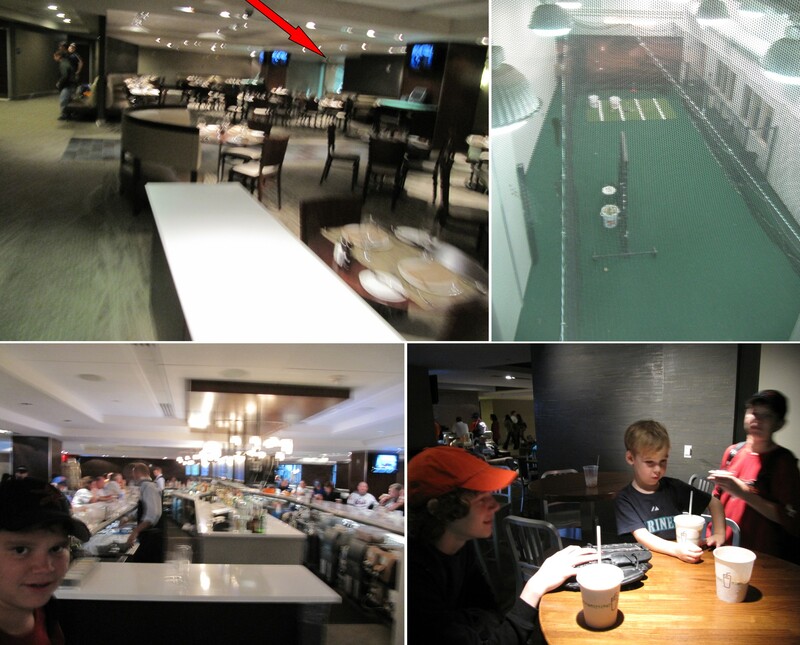 See the red arrow in top middle of the restaurant? Its pointing to floor-to-ceiling windows that overlook the visitors’ practice batting cage, which are pictured at the top right. For perspective, the restaurant is to the left as you enter the Sterling Club and it is located roughly behind the 3B dugout. As you view them in both of the top pictures, the field is to the left of the restuaurant and the visitors’ batting cage. At the bottom left, there is a fancy bar (and Joe’s head). For perspective, the restaurant is behind me as I took that picture and home plate is behind the left side of the bar. In the bottom right, we are sitting in a little nook in the far opposite side of the Sterling Club next to a bunch of windows overlookign the Mets batting cages (they have two cages, the visitors have only one). 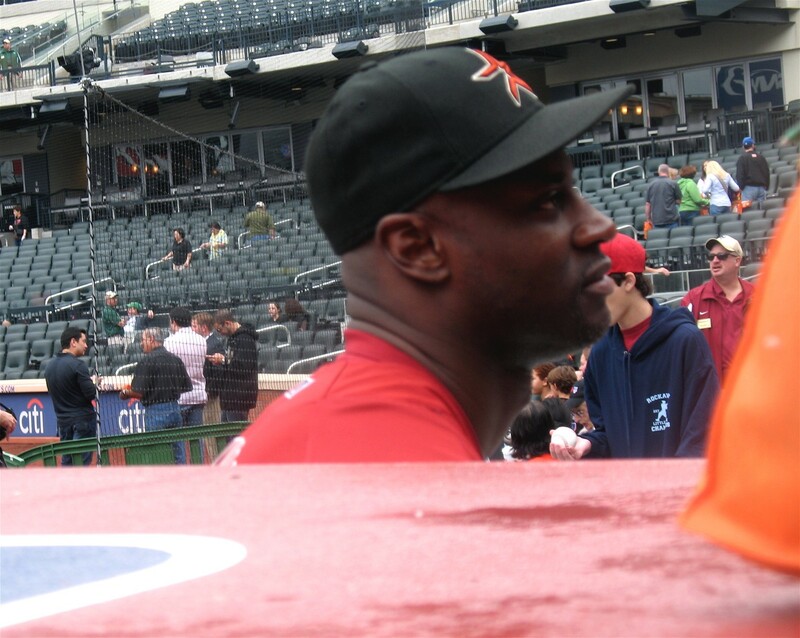 For perspective, the Mets (1B side) dugout is just behind and to the right of me as I took this picture. At this end of the Sterling Club, there is another fancy bar. This one is more of a lounge style bar. The bar is across the back wall (opposite the field) and the rest of the room has scattered seating. In that picture, we are drinking delicious FREE MILKSHAKES. It was the best chocolate milk shake I’d had in a long time. This lasted about 10 minutes before an usher shut us down. After spending some time by the bullpens and in the RF concourse (where Tim clanked Cow Bell Man’s cowbell, Tim and Joe ran several races and Alex and Joe swung Tim around by his feet and hands), the rain stopped! As the grounds crew prepared the field, the P.A. announcer invited the remaining fans to sit wherever they could find open seats in the field level (other than in the Sterling Club). Unfortunately, no one hit a homerun for the rest of the game. 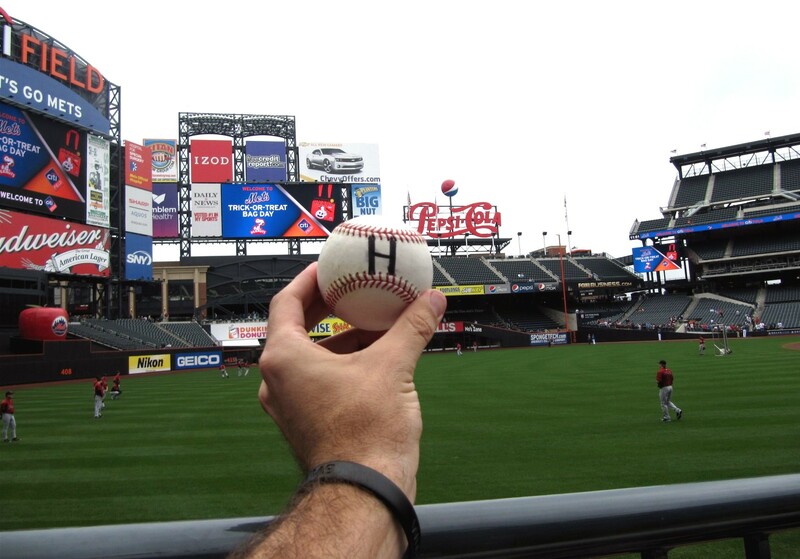 Although we’d already got two balls on the day (our first ever in Queens), I wanted to get a ball from the umpire because it would be a commemorative Citi Field inaugural season ball — this would be our last and best opportunity to get one of those balls. Soon, Alex and Joe both turned up. They had the same idea. …while no foul balls came our way, Tim did collect a commemorative ball from home plate umpire Damien Beal (above to right). After chatting with Alex and Joe a little bit more, we said our good-byes (we’ll be keeping our eye out for those guys next season) and Tim and I headed to the 7-Train platform. …that place always looks great in photos. And that’s the story of our final national league game of the season. 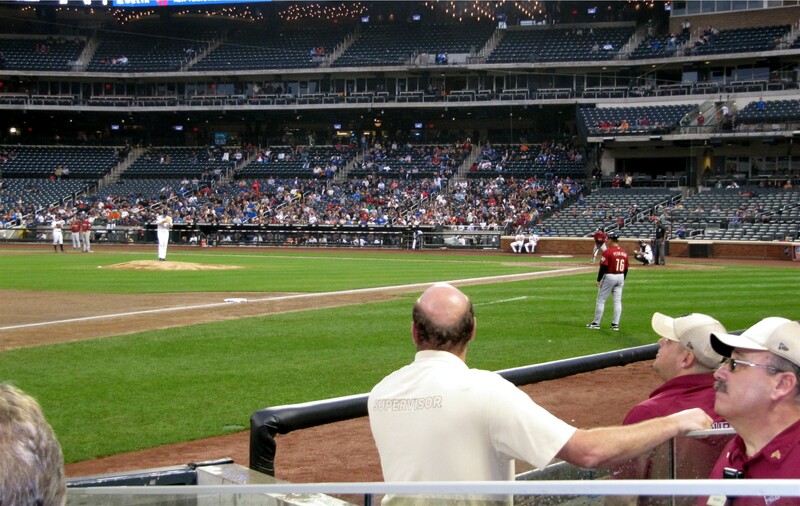 After this game, I have a much better feeling about Citi Field. I still don’t like the closed-off concourse behind home plate or the design of the standing room areas (no standing counters), but we had a great day in Queens. The following day, we’d be in Baltimore for the final game of the season.